Many firms have implemented corporate governance, yet have fallen into collapse and scandal involving their operations. What has gone wrong? 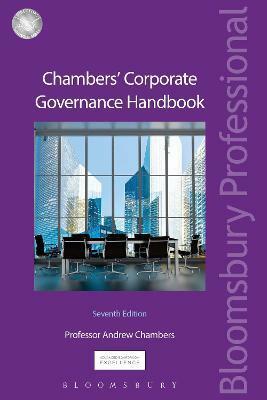 Chambers' Corporate Governance Handbook is the definitive, practical guide to the ever changing corporate governance landscape highlighting the potential pitfalls, tackling the issues, placing blame where appropriate, and recommending possible solutions to these problems. Providing invaluable, practical guidance Chambers' Corporate Governance Handbook ensures that you are up to date and compliant with best practice giving you complete confidence that you are continuing to function within the legal, ethical and practical parameters of corporate governance. In addition: Includes coverage of the autumn 2016 release of the updated UK Corporate Governance Code; Family Firms and their Governance expanded to cover SMEs; Corporate Social Responsibility, Integrated Reporting and Sustainability (Chapter C5) will be expanded to cover ESG (Environment, social and governance) and a new ESG checklist will be included. Chapter C4 Do Non-Executive Directors Add Value? Chapter H2 Is Audit failing the Global Capital Markets? Andrew Chambers chairs FEE's Corporate Governance and Company Law Working Party. FEE (www.fee.be) is the federation of European professional accounting bodies. He was twice mentioned in House of Lords' debates as an authority on corporate governance and by The Times as `a worldwide authority on corporate governance'. He was Dean of the leading Cass Business School where he is professor emeritus. Appointed in 2010 as the Specialist Advisor to the House of Lords' Economic Affairs Select Committee's Inquiry into Auditors: market concentration and their role that led to audit market reforms. Andrew was one of a seven member UK committee that in 2013 published enhanced `Internal Audit Guidance for Financial Services'. Andrew is a jurist for the Hawkamah Bank Corporate Governance Awards in the MENASA region and for the ICSA Hermes Transparency in Governance Awards.